What is a Body Butter? - CaLoveCo. Most people think it’s a kind of lotion. Here’s the difference between a lotion and a body butter. In a lotion, water and oil are the key ingredients. Well, water and oil don’t mix, so a lotion needs an emulsifier to make the water and oil play nice together. Plus, you need a preservative for anything that contains water. That’s just the way it goes, because water creates bacteria. But in a body butter, oils and butters are the main ingredients. And oils and butters always mix well together. There’s nothing wrong with preservatives in general. But not all preservatives are created equal. If you want to learn more about preservatives in natural products, check out this article. But just keep in mind that water is the queen of moisturizers, and any product that contains water or a water-based ingredient must also contain a preservative. That’s just the way that cookie crumbles…to keep you healthy. So, I personally think body butters are better than lotions for dry skin or when the weather is dry. Lotions absorb very quickly, which means you can’t always tell if they work or not. That is, they absorb so quickly that you can’t tell whether your skin is moisturized or not. 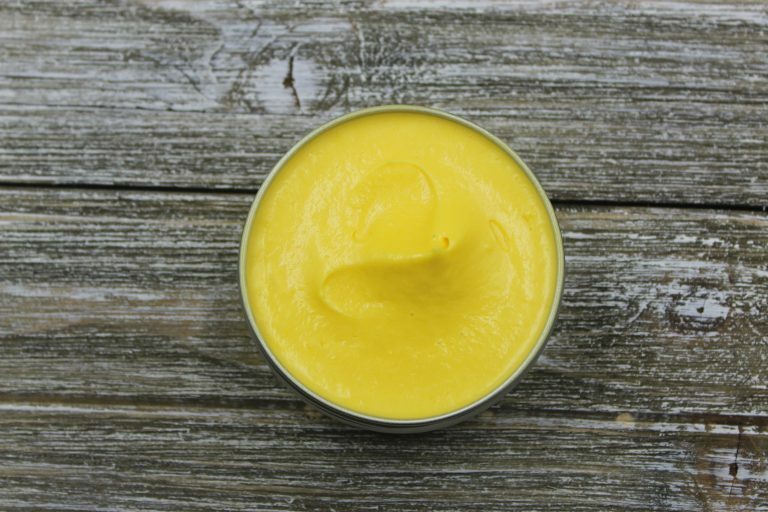 Body butters have a much slower absorption rate. That means, they’ll sit on your skin for a bit and absorb slowly. But your skin will absorb the moisture and stay moisturized for longer. And a little bit goes a long way. A long, long way. So, more bang for your buck. Who doesn’t like that? So, who is a body butter for? A body butter is for anyone who experiences dry skin. For your feet, apply a body butter at night and wear a pair of socks to bed. After a week or two, you’ll experience baby soft feet. You can do the same with your hands, if you don’t mind going to bed with gloves on. Applying a body butter to your hands throughout the day can reduce and even eliminate the pain of dry hands and cuticles. After every time you wash your hands, just reapply. If you like to lift heavy weights, keeping your hands moisturized with a body butter can keep calluses at bay and leaves you with softer hands. And if you’re looking for an all over skin fix, there’s no better way to get your skin glowing than with a body butter. No flakes. No scales. No itchiness or dryness. Just soft to the touch. Check them out when you have a chance. You won’t be disappointed.